I will be sitting down later this week with Ron MacLean, long-time sportscaster and former host of Hockey Night in Canada. He'll be dropping by next week to record an episode of my podcast Toronto Mike'd, and I get an entire hour to ask him anything I want. I know what questions I'll be asking him, but I'd love to know what you would ask him. 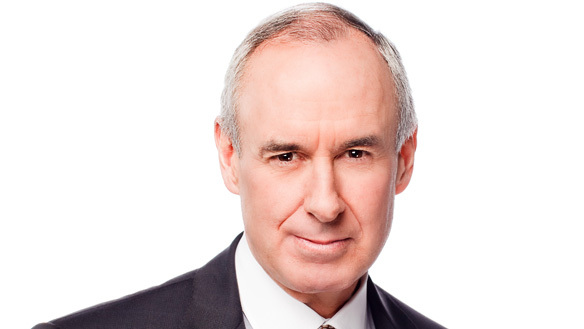 What questions would you like me to ask Ron MacLean? I have one for Ron. How does he put up that boorish loudmouth he is saddled with during coaches corner? Which was Ron's favourite Olympics that he hosted and why? I know Ron is a car guy, and he use to have a mint condition early 90' s Mustang. Does he still have it, if not what is he driving now? Was he the originator of the idea to run the Hockey Days in Canada program? Ask Ron about his vast experience refereeing! I know he's refereed at all sorts of levels of hockey and also refereed an NHL pre-season game a few years ago. The infamous Dave Hodge pen flip changed your life. Were you watching the night it happened? Did you ever imagine the road it would take you down for the next 30 years? Is Don Cherry the greatest gift you ever received ? Does he miss HNIC on Saturday night? What does he think of Rogers' broadcasts of hockey now? Does he have any pet projects? What are the chances/interest of Ron hosting a nationally syndicated sports radio show? As an aside, when Ron was an active ref, he was good, actually very good, in that he communicated with players during the play and after the play. Always appreciated this as a coach, because players knew what to expect from him, and as a coach, we had a better idea on what he saw. He let the game play out, and if was getting chippy, he brought it back quick. The first generation Mustang is my favorit, but I also really like the 87/93 era too. I remember as a kid thinking the Mustang 5.0 was the coolest car around. I'm a car nut and could talk about cars all day. Ask Ron what's the most memorable game/event he's ever covered, and also what was his favorit. @Jason I have an 83 5.0 Convertible fox body, I still think it is fast, but most Kias, and Hyundais from the factory now out horsepower me Lol. Sad but true. I would still take a fox body Stang over a Kia any day though. Nothing cool about a Kia. Ask him why he thinks he is a Mr. Know-it-all when it comes to sports, culture, music, politics? He & Strombo come across as intelligent zombies. Figure that one out Ron. Glad he got canned, he became to nauseating, like his partner. Another hack in a long list of overpaid salaries by the CBC. Good catch with Ron MacLean, Mike. Cool guy. Always have enjoyed him on TV whatever he's covering. Here's a bit of humourous question. Does Ron think Bubbles would have been a good fit for a dream line with LaFleur and Gretzky? I have always enjoyed watching Ron. Does he feel that doing Hometown Hockey is a demotion or does he appreciate getting back to the roots of the game? To expand on the referee questions already asked, how have spectator attitudes changed over the years if at all. I always felt like hockey officials had it the worst of any sport. Some of the worst instances of humanity i've witnesses have taken place in a rink. I umpires baseball and never heard anything like i heard in hockey arenas. What do he and Brad Richards do to keep the spark alive after all these years? When he watches Strombo attempt at hosting HNIC, does he feel exactly like Phil Collins watching some woman (who no one's ever heard of) sing 'Against All odds' at the Oscars (circa 1980s)? Note: If you don't get the reference look it up - you'll laugh when you do. Mike, Ron is always stressed on coaches corner, can you ask him if he ever has had to stand up to Don Cherry or have actually gotten upset off camera with him? Mike, have you been deleting comments? Just one from Collingwood Dave because it wasn't fair to Ron. Mike, it's your site. You really don't owe me, or anyone else, an explanation. The fact that you do so is one of the reasons I enjoy your forum. So civilized. I don't know who Dave in Collingwood is, but he's commented exactly twice. I let the first one first go, but the second one got clipped and my patience with Dave in Collingwood evaporated. Ron McLean isn't on Hockey Night in Canada anymore? Does the show still exist? I had no idea. Why so I get the feeling HNIC is just cringe worthy now. He's still co-hosting Coach's Corner with Don Cherry. I would like to hear Ron's thoughts on concussions and where our changing understanding of head injuries will take the game. Will fighting go? What about body checks? I am old enough to remember Brian Glennie and Denis Potvin standing guys up at the blue line. And Scot Stevens was a monster. and CTE I think we may see more changes. Excellent opportunity, can you please ask him where the inspiration came for "American Pie" and what some of the references mean, it's my favorite song. Thanks Mike. @Mike: When is Ron dropping by? @Mike: I know you ocasionllly have to deal with publicists when trying to get people on the podcast. Was this the case here or did Ron actually get back to you himself? Thankfully, I always dealt with Ron directly. Very, very few guests have had that PR layer. In fact, scanning this list, I only see a couple. Cann't find any one that can give me a factual answer. 1. On Hockey Night in Canada March 11 2016, you showed a clip of the game between Pitt. Pens, and the Ed. Oil. In that game in over time, McDavid broke in on goal, deaked aroung the tender and was about to shoot at an open net. He surely would have scored, but for an obvious trip by the tender. There was no Penalty call, you agreed with this? Can you give an full explanation as to why this would no be a penalty. 2 (a) do away with the trapezoid, allowing the tender to go out and play the puck as he wishes. 2 (b) allow contact with the tender when he is out of the blue paint, ( in a similar manner that the NFL, CFL, allow the quarter back to be hit if he is in possession of the ball.) the quarter back can be hit, but in a lot less vigorous manner, than if he were a running back with the ball. Similarly, a tender can go out play the puck, but would be subject to contact in a limited fashion, Similarly, if while out of his net, the tender would be more subject to slashing, tripping, interference calls if he brakes the criteria. At present, it appears the tender is allowed out of his net to play the puck out side the trapezoid, but can then "block out", a for checker coming in, with immunity form an interference call. Your very respected input please. Thank you sir. Very much miss the old Coaches Corner.